As 'near neighbours' Crossfields residents have been invited to comment on this application (which we last mentioned in September). All should have received the formal letter from Lewisham Planning for application DC/14/89953. Mixed use development at Kent Wharf and 24a Creekside SE8 comprising the construction of three buildings ranging from 6 to 16 storeys incorporating balconies and terraces comprising 1,375 sq.m of commercial floorspace (use classes B1/D1/D2), 143 residential units (Use Class C3) public and private amenity space, together with associated landscaping, refuse stores, 184 cycle spaces, 3 car parking spaces, associated highway works and plant. The illustration above shows the development in isolation to the other FOUR new towers planned for this end of the Creek (see below). According to the Lewisham Planning Portal, the application from Bellway Homes was received by Planning on November 26th. A trick often employed by developers is to submit an application at Christmas time when everyone is too busy to notice or do anything about it. So we get a letter from Planning on 19th December with a deadline to comment by 8th January. Of these 20 days, three are bank holidays – so that's really only 17 days. But worse still, Planning has not put up ANY documents related to this application. We called the planning officer in charge of it this morning to find out when the drawings and detail would be added to the website, only to be told he is on annual leave. One of his colleagues said the documents were being scanned and would be available to view tomorrow. So, that brings the time for commenting down to 14 days. The same thing happened two years ago with the Faircharm development. On that occasion Lewisham Planning decided to extend the deadline (see our Jan 2013 post) – they disliked this application so much and requested so many revisions that the deadline was eventually extended till May. Long before that, they had attempted to mitigate the worst aspects of Workspace's plans by designating the area a Conservation Zone. Ultimately, they passed the application, claiming to be 'at the mercy of market forces'. However, they have already been working with Bellway Homes on various aspects of the Kent Wharf site, so they are probably fairly happy with the application. Apparently at Lewisham's request, earlier versions of the development have altered so that the 12 storey tower originally positioned on the Deptford Creek waterside has moved to the road side edge of the plot. Four more floors have been added, which is presumably a compromise for either more affordable housing units, or for more space to be given over to creative business units / artists studios (which were lost in the Faircharm proposals). Update 26 December: We received an email from the planning officer on Xmas eve stating that "the Council will be accepting comments after the normal 21 day consultation period for the proposals at Kent Wharf due to the Christmas period". The bad news is that there are now an extraordinary 81 documents associated with the application available to view on the planning portal! As Kitewood's website / flyer states, this is in addition to separate proposals from Essential Living for Greenwich Creekside East. Apparently there was a public exhibition of their plans on 6th December but we were not informed about it – probably because, although it is practically on our doorstep, the development falls within Greenwich Council's remit. The exhibition boards can be viewed at www.greenwichcreeksideeast.co.uk and you are invited to let them know your views by emailing michaels@curtinandco.com (see the visual below). Again, we are not shown a visual that shows all five towers of the three different developments all together – nor any view that includes the SIXTH tower a few blocks down (and much closer to Crossfields) that will be built at Faircharm. 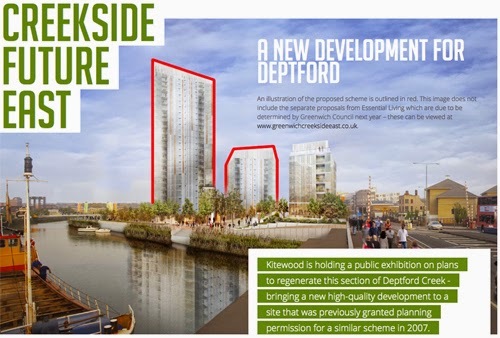 The Deptford Dame has very recently posted about Greenwich Creekside East – essential reading on Essential Living's plans. And although all this stuff has been on the cards for some time, it is still rather shocking to contemplate the phenomenal changes that lie ahead! Crossfields is now a building site as MITIE proceed inexorably slowly with their 'Decent Homes' programme. It's unlikely to be finished before the end of summer 2015, by which time work may have finally begun at Faircharm. There is no escape! Merry Christmas! 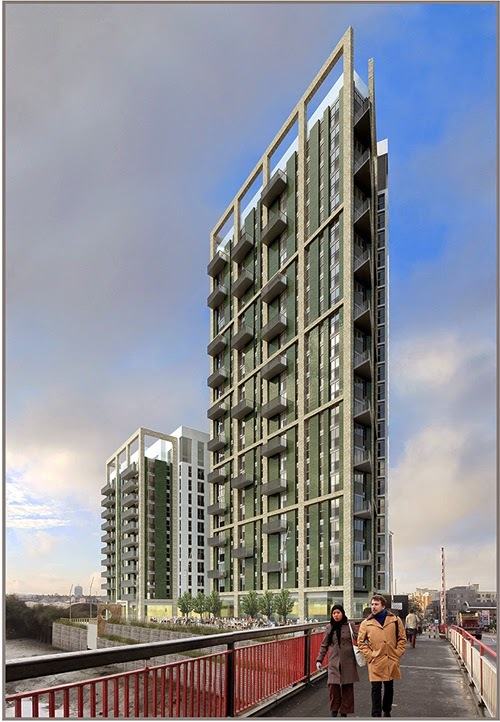 Update Jan 25th 2015: See our detailed look at the Kent Wharf application to Lewisham Council here. Also see our notes on Creekside East and the live application to Greenwich Council for Greenwich Creekside East here. They all look very exciting. Once the dust has settled (literally! ), the area will be a buzzing. They've been a long time in coming, but I'm glad to see the area springing into life. They don't look that bloody exciting. I sometimes think developers have a selection of 5 different styles and 5 different details packages and the whole building is designed on excel by accountants. Oh wait. I don't think that. I know it. Agree with anonymous #2. That said, it'll look a damned sight better than currently, or any of the 90s buildings in the vicinity. It would be nice if some of these projects had more community and retail opportunities...to create a settlement for the residents...though I suppose it's all about buy-to-let. @anon #1 you should get out more. The 'wind effect' around these towers in winter will be bitterly cold! Do you need help with computers?